John William "Willie" Grout, 15th MA Infantry, was commissioned a Lieutenant right out of high school at the age of 18. He was killed at the Battle of Ball's Bluff, VA, and was the first soldier from Worcester to be killed in action during the Civil War. The song "The Vacant Chair" was composed in his memory and became very popular in the North as well as the South. He is buried in Rural Cemetery, Worcester, MA. George Hull Ward, 15th MA Infantry, enlisted as a Lieutenant Colonel, July 24, 1861 and promoted to Colonel into Field and Staff on April 29, 1862. He was wounded during the Battle of Ball's Bluff, VA when his left leg was amputated below the knee. He returned to Worcester where he convalesced and recruited men for the 15th. In 1863, fitted with an esthetic leg he rejoined the 15th in time for the Battle of Gettysburg, PA, when, standing in front of his men on Cemetery Ridge on July 2nd was struck down by friendly artillery fire. He died the following day from his wounds. He was posthumously appointed the rank of Brevert Brigadier General and Fort Ward on Bainbridge Island, WA was named in his honor. George Ward was a 36 years old farmer at enlistment and is buried in Rural Cemetery, Worcester, MA. George W. Wellington, joined the 2nd MA Heavy Artillery when he was 18 and right out of high school. He was taken prisoner at the Battle of Plymouth, NC and sent to Andersonville prison, GA where he died less than four months later. He is buried in the Andersonville National Cemetery (grave no. 5214), however his family has a plot in Rural Cemetery, Worcester, where they placed a stone in his memory. On the top of the stone in raised letters reads "A Victim of Rebel Barbarity." Thomas Jefferson Spurr, enlisted into the15th MA Infantry as a 1st Lieutenant, his age was not listed. He was wounded at the Battle of Antietam, MD, September 17, 1862, and died from his wounds in Worcester, MA on September 27, 1862. Dwight Newbury, 15th MA Infantry, joined as a private but received two promotions, first to Sargent Major in April of 1863 and then to 1st Lieutenant in July of the same year. He was killed at the Battle of Mine Run November 27, 1863. He was 23 years old at the time he enlisted and was a bookkeeper before the war. Samuel Foster Haven, 15 MA Infantry, enlisted as an Assistant Surgeon and promoted to Surgeon in the Field and Staff on July of 1862. He was killed December 13, 1862 at the Battle of Fredericksburg, he was 32 years old. Charles H. Pelton, enlisted into the 3rd MA Rifles as a Private in June of 1861, six months later he transferred into the 25th MA Infantry as a Sergeant. He received two field promotions, one in January, 1862, to Sergeant Major and again in October 1862 to 2nd Lieutenant. He was killed at the Battle of Cold Harbor. His occupation was listed as a clerk and was 26 years old at the time of his death. William B. Bacon, listed as a 19 year old gentlemen, enlisted in the 13th MA Infantry as a Lieutenant in July of 1861 and then as a Captain in the 34th MA Infantry in August, 1862. He was killed at the Battle of New Market on May 15, 1864. Harrison W. Pratt, a 31 year old Machinist enlisted as a Captain in the 34th MA Infantry, April 22, 1861. He was promoted to Major in August of 1862. Wounded three times, once each at the Battles of Piedmont, VA (June 5, 1864) and Berryville, VA (September 2, 1864); but he was accidently wounded September 22, 1864 at Fisher's Hill, VA and died three days later. Albert C. Walker, a 21 year old Mechanic from Worcester enlisted as a Private into the 6th MA Infantry at Boston, MA in April, 1861. In April of 1862 he was commissioned into the 34th MA Infantry as a Lieutenant and two months later as a 2nd Lieutenant. He died nine days after sustaining wounds on June 5, 1862 in Piedmont, VA.
Samuel F. Woods, a 23 year old lawyer and resident of Barre, MA first joined the 3rd MA Rifles in May,1861 as a 3rd Lieutenant but mustered out to be commissioned as a 1st Lieutenant and Adjutant in the Field and Staff 34th MA Infantry. He was wounded at the Battle of Piedmont, June 5, 1864 and died from his wounds on June 26, 1864. Henry H. Rice, listed as a 24 year old baker enlisted in the 36th MA Infantry as a Corporal. During the Battle of North Anna River, May 25, 1864, he received a severe wound to his right leg, he died of his wound on June 1, 1864. Samuel M. Bowman, a 26 year old from Clinton first joined the 51st MA Infantry as a Sergeant in September of 1862 but mustered out one year and three months later to take a commission as a 1st Lieutenant in the 57th MA Infantry. During the July 24, 1864 Battle of Petersburg he was mortally wounded in the thigh and leg by a Confederate mortar shell. Edwin I. Coe, was an 18 year old clerk who enlisted in the 51st MA Infantry in September, 1862 as a Private and then as a Second Lieutenant into the 57th MA infantry. At the Battle of Spotsylvania Court House in May of 1864 he received a wound to the head. He was killed at the Battle of Petersburg, VA on June 17, 1864. 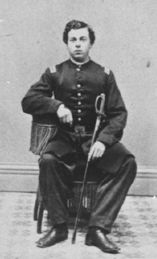 William E. Richards, a 19 year old student enlisted into the 51st MA Infantry in September, 1862. In January, 1864, he was mustered into the 57th MA Infantry and promoted to sergeant three months later. He was discharged to accept a post as clerk in the 1st Division, IX Corps. He died of disease in Worcester, MA on March 16, 1865. Dexter F. Parker, a 32 year old Worcester resident enlisted on April 16, 1861 as a 4th Lieutenant into the 6th MA Infantry in Boston, MA. Four months later he mustered out and was commissioned in the Field and Staff of the 10th MA Infantry as a Major. On May 12, 1864 he was wounded at the Battle of Spotsylvania Court House, VA and eight days later had his right arm amputated. He died of his wounds on May 30, 1864 in Fredericksburg, VA.
William Nelson Green Jr., an 18 year old student enlisted right out of high school into the 25th MA as a Private in September of 1861but was discharged six months later to receive a commission as a Second Lieutenant in the 102nd NY Infantry. He was promoted Captain and then to Lieutenant Colonel in June of 1863 in the 173rd NY Infantry. He was taken prisoner at the Battle of Cedar Mountain, VA, August 2, 1862 and was confined in Libby Prison, Richmond, VA, until being paroled. On April 9,1864 he was severely wounded at Pleasant Hill, VA , where his left arm was amputated. He died of his wounds May 15, 1864 in New Orleans, LA. He was promoted, by Brevet, to Colonel and then to Brigadier-General April 9, 1864. George W. Haskell, enlisted on November 6, 1861 as a Private into the 1st VT Cavalry. He re-enlisted on December 30, 1863. He received wounds at Ashland, VA and died on August 1, 1864 in Washington, DC. Note: his place of residence was listed as Vermont, somehow he had a connection to Worcester.